This could very well be the starting line of a joke but it's serious: one of the world's best restaurants, the founder of the new Nordic kitchen, and the one to make it famous worldwide, the fine dining restaurant that cooks exclusively with Nordic ingredients set up shop right between the jungle and the sea in Mexico. For two months, they do their magic here, like no other could. Tulum is a small holiday destination on the Yucatan peninsula, with 18 000 residents and more importantly, with a fantastic sandy beach stretching for miles by the turquoise sea. Beyond the narrow sandy stretch and a road, it's the jungle. This is where all the hotels and restaurants chip away the available land. Only a couple of years ago, you could still get a "cabana", i.e. hammocks under a roof, for peanuts. By now, tourism has done its work and the area became more professional but there's still no electricity, neither gas nor running water in the neighborhood. As such, Tulum is firmly sticking to its hippie holiday village character. An important feature is that there's only one season, but that lasts the whole year. And in addition to the beautiful, picturesque location, this destination also offers a 1300 years old Maya ruin. And now a luxurious restaurant, but not for long. The post-booking newsletter had already warned me that this is a tropical jungle restaurant, which means that even the quite informal Noma etiquette rules would not apply. The waiters would be in shorts and flip flops, and they don't expect anything fancier from the guests, either. Oh, and there would be no roof above the dining area, high humidity is to be expected and even a tropical rain can occur anytime. And indeed, there was nothing close to a roof, only the quickly growing leaves of the recently installed plants provided some shelter. There was no flooring, either: we arrive at our table walking in very fine sand. Seeing this, even the flip-flops sound excessive, and anyway, I've never been to a luxurious restaurant barefoot and in shorts... If anything comes close to going to a fancy restaurant in shorts, it's when I realized the day I had a reservation to one of the German 3 Michelin starred restaurants, the Vendome, that I only packed my jacket and forgot my trousers. (In the end, I fixed the issue of the red shorts that would have not really been compatible with a fancy castle restaurant by squeezing in a small shopping trip.) But here - although many of the guests didn't follow the advice - even the beachwear was very appropriate. The abundance of the plants sets the tone, but it's the turquoise sea and the sandy beach, where the romance starts, as it is recommended to start the evening in a nearby beach bar. The fine sand continues in the restaurant, and is complemented by the luscious but still obviously well-planned jungle ambiance, with lots of greens and flowers, the most important decoration in the restaurant. A few tables showcase all the ingredients, and here they can still be admired in their original, natural shape before they are transformed and served on the plates. Juicy manililla mango, different cactus fruits, spicy pasilla chile that is cooked in melipona honey and is filled with chocolate sorbet, a fruit called mamey, of which the seeds are used to make ice cream that tastes like marzipan and is served on a grilled avocado, unique, local root vegetables, huge jackfruit, young coconut and of course many others that wouldn't surprise anyone even at home, in Hungary, thanks to Columbus: ripe tomatoes, cocoa beans, pineapple, corn, mini squash... A great start to a fantastic dinner. [The full menu and photos of the dishes here!] Although there are some bizarre ingredients, they are not here for their shock-value. They are here because they are all delicacies of the traditional Mexican kitchen, served and prepared tastefully. The octopus steamed on corn leaves under lid was by far the best dish I have ever eaten, but, together with the pumpkinseed sauce, it was an unforgettable experience. The most surprising feature of the menu is that after each sensational dish, the excitement and experience could still be intensified. There's no break for even a minute, there's no less important dish that would only serve to refresh our palate, it is a series of big-guns. 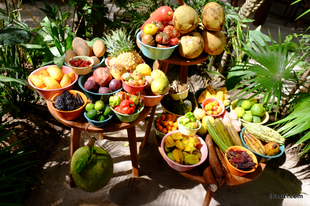 Those who make the journey to Tulum because of the fame of Noma and Redzepi are well appreciated and compensated for their efforts. The octopus could have been the highlight if a slow roasted little pork wouldn't approach on banana leaves. Coming from the cerdo pelon variety, its task is to contribute to the most perfect taco experience of my life. The tortilla for this dish is exceptionally not made by the Noma team, but by a group of Maya women, who have decades of experience in preparing and shaping the dough made of Yaxunah corn, on which then the different meat cuts and cracklings of the pork are served. This is followed by the pride of the Mexican kitchen, the mole, which is a thick, spicy sauce with strong flavors that exist in many different variations, mostly full of chile and chocolate. It's sweet and savory at the same time. This time, it was served to accompany a local leaf, the grilled hoja santa, and it was made according to the family recipe of Noma's former pastry chef, Rosio Sanchez, who already set up her own business, a super authentic taqueria in Copenhagen. She joined her former team for this Mexico project. The desserts didn't disappoint, either: the already mentioned avocado with mamey ice cream and the - mortifyingly - spicy chile peppers filled with chocolate sorbet, served with local cocoa to soothe the burns inside the mouth. The menu comes with a well-thought-through, elaborate drinks pairing of local craft beers, mezcals, wines, and, at the end, the special Mexican cocktails served at the bar help to digest the experience. Though I've been to many of the best restaurants in the world, and have tasted the food of many of the best chefs, this has been the best food experience of my life. In particular, the creativity and perfect execution, paired with the unforgettable atmosphere, ambiance, the jungle and the sea made it the experience of a lifetime for me. After the Noma menus in Copenhagen, Redzepi and his team ventured into a whole new territory, they surprised me and they created something fantastic and long-lasting! And not the Mexican ingredients represent the most exciting novelty in the career of Noma, but the fact that they haven't worked with spices before! 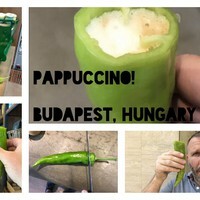 And here they used them bravely and with great enthusiasm, and they created a unique, incomparable menu by taking the spiciness sometimes even over the limit of fine dining. No wonder they are the world's best restaurant to me. Noma, as I already mentioned, takes their pop-ups very seriously. It's easy to see this from the number of staff. Together with family members, 146 persons moved to Mexico for months, thus, when looking for a location, it was very important to find an English school. Although quite a few children came with them, the emphasis is still on work: 110 persons are working in the kitchen, 30 of them in the service, 60 in the kitchen. They also have 6 dishwashers, among them the always happy, legendary Ali Sonko from Gambia, who has been a member of the team since the beginning. He is the one who became co-owner of the restaurant earlier this year, and, according to the official reasoning, the motive behind this was that he is the heart and soul of the restaurant. The dishwashers aren't working among ideal circumstances, either, as one of the characteristics of the chosen venue is that there's no running water, neither electricity nor gas. So the team has to face quite some challenges every day. For cooking and baking, they built complicated, wood fire equipment, ovens, grills. Three drivers - who drive daily the group of the tortilla making women to the venue - and 10 administrative employees make the team complete. They make sure that the 4800 guests are entertained, while they eat 77 000 meals during a period of 7 weeks. 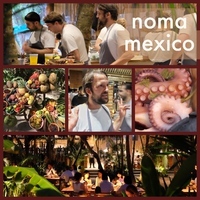 Of course, the menu didn't just plan itself: last year, Noma led 6 expeditions to Mexico and the chefs explored the ingredients and kitchen techniques throughout the country, from Merida to Enseda and from Oaxaca to Guadalajara. Click here for the whole menu with photos! Follow me on Facebook and Instagram for more foodie stories from the world's best restaurants!